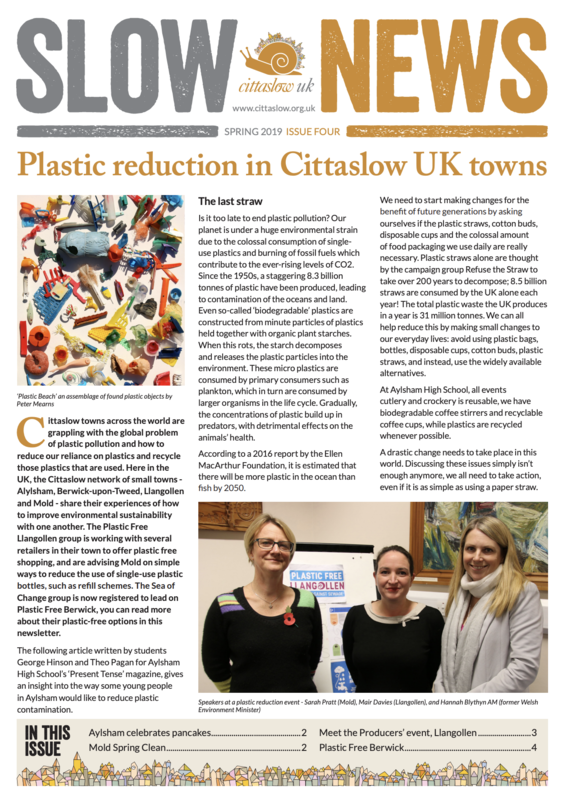 Cittaslow towns across the world are grappling with the global problem of plastic pollution and how to reduce our reliance on plastics and recycle those plastics that are used. Here in the UK, the Cittaslow network of small towns - Alylsham, Berwick-upon-Tweed, Llangollen and Mold - share their experiences of how to improve environmental sustainability with one another. The Plastic Free Llangollen group is working with several retailers in their town to offer plastic free shopping, and are advising Mold on simple ways to reduce the use of single-use plastic bottles, such as refill schemes. The Sea of Change group is now registered to lead on Plastic Free Berwick, you can read more about their plastic-free options in this newsletter.